The American death metal masters return with what could be their best album to date. Metal bands have always shown a deep fascination with Egyptology over the years, in particular, the darker aspects of ancient Egyptian history, art, religion, and mysticism. Over the last 25 years, many bands have dabbled in Egyptian themes, from Mercyful Fate's legendary "Curse of the Pharaohs", to more contemporary metal bands such as Behemoth, Necronomicon, and Symphony X, and of course, Iron Maiden's 1984 album Powerslave and the lavish, prop-laden live show that followed. However, no band comes close to equaling the fervor of South Carolina's Nile. Displaying a fascination with All Things Egyptian that borders on obsession, the band, led by guitarists and co-vocalists Karl Sanders and Dallas Toller-Wade, have fused those lyrical themes with an absolutely bludgeoning style of death metal, and in doing so, have become one of the most powerful, distinct death metal bands in the world. Musically, Nile's style might derive a fair bit from Egyptian and Middle Eastern sounds, but their sound is deeply rooted in classic death metal, in the same vein as the genre's great progenitors, Death and Morbid Angel. While countless bands have mimicked both bands with varying degrees of success, it's Nile's ability to make that style of music sound so exciting, that makes them stand out above every other American death act. Their 2002 album, In Their Darkened Shrines, is regarded by many as a masterpiece, and deservedly so, the music offering a simultaneous assault of frenzied drumming, nimble, melodic riffs and guitar harmonies, guttural vocals, and sweeping, symphonic splendor, culminating in the astounding 20-minute, four-part title track. 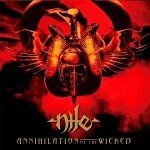 With the arrival of Annihilation of the Wicked, one of the most hotly anticipated metal releases of 2005, Nile have not only proven that they remain the undisputed masters of American death metal, but they've managed to equal, or dare I say, even top their highly acclaimed previous record. If hearing In Their Darkened Shrines left listeners impressed, Annihilation of the Wicked will leave them awestruck. By bringing in veteran producer Neil Kernon, who has been behind such pristine sounding metal albums in the past, most notably Queensryche's underrated Rage For Order and Nevermore's Dreaming Neon Black, Nile have put out by far their best-produced album. True to Kernon's style, the mix is impeccable; the roar of the music is massively heavy, but it's so finely tuned, so crisply recorded, that it's just as easy to lose oneself listening to the more subtle musical arrangements as it is to absorb the sheer force of the band's performance. The theatrical grandeur of In Their Darkened Shrines is most noticeably absent on the new record, as scene-setting tracks like "Chant Song" and "Hall of Saurian Entombment", from the last album, have been replaced by a much more focused attack, but that said, the epic scope we've come to expect from Nile is still present. We do get a couple brief musical interludes before the mayhem resumes, but they're only brief enough to allow us to catch our breath before going for our throats again. Such a contrast from atmospheric and contemplative to a deafening barrage is enthralling; as the bouzouki-inspired, acoustic opening track "Dusk Falls Upon the Temple of the Serpent on the Mount of Sunrise" fades out, the frenzied blastbeats and staccato riffing of "Cast Down the Heretic" instantly kick into high gear, as Sanders and Toller-Wade deliver chord progressions, lightning-fast picking, and harmony licks that are absolutely dizzying, highlighted by an extended maniacal, Slayer-style dual guitar solo breakdown that is arguably as good as anything Nile has done in the last five years, as blunt brutality takes a backseat to inspired melodies and technical proficiency. From then on, Annihilation of the Wicked doesn't let up for a second. "Sacrifice Unto Sebek" is the most simply-arranged song on the album, three minutes of pure speed and heavy riffs, while "Lashed to the Slave Stick", on the other hand, is the closest thing to an accessible track, the cacophony reined in just enough to engage new listeners, the track highlighted by spry guitar flourishes during the choruses. This being a Nile album, there's no shortage of lengthier tracks: "User Maat Re" slows things down to a crushing, doom-style pace, "Annihilation of the Wicked" is much more complex, employing as many changes as a Mercyful Fate song, and the grimly majestic, symphonic "Von Unaussprechlichen Kulten" concludes the album with a foray into the world of legendary writer H.P. Lovecraft. However, it's the four-minute "The Burning Pits of the Duat" that will have collective jaws hitting the floor, a crushing display of ungodly aggression, wrist-debilitating fretwork, and absolutely insane bass drum blasting, which apparently maintain a 256 beats-per-minute rate for the entire song. Although many will find the vocal work of both Sanders and Toller-Wade a bit on the repetitive side, one's appreciation for their vocal work increases greatly when reading Sanders's lyrics. His depictions of Egyptian mythology and history are often told in the first person, and are always well done, and you can sense the wicked glee in his descriptions of the ultra-violent depictions of torture in songs like "Cast Down the Heretic" and "Lashed to the Slave Stick". Always one to inform fans as much as they can, Nile albums always come with extensive liner notes written by Sanders, explaining the historical significance of each track, as well as the thought process that went into composing the songs, and Annihilation of the Wicked is no exception, as he spends a whopping 5,000 words giving listeners as much background information as possible. Lucidly written in a casual, yet studious style, the care Sanders puts into explaining his music makes the music all the more enjoyable. Death metal is one of those musical styles that isn't for everybody, as it can be an acquired taste, but everybody needs a little of everything in their record collections, and if there's one death metal album from 2005 that's definitely worth hearing, it's this one. Nile's music is masterful, brilliantly brutal art, and Annihilation of the Wicked has exceeded everyone's lofty expectations, and is easily one of the best metal releases of the year. Strap yourselves in, keep your arms inside the whole time, and get ready for a ride you won't soon forget.